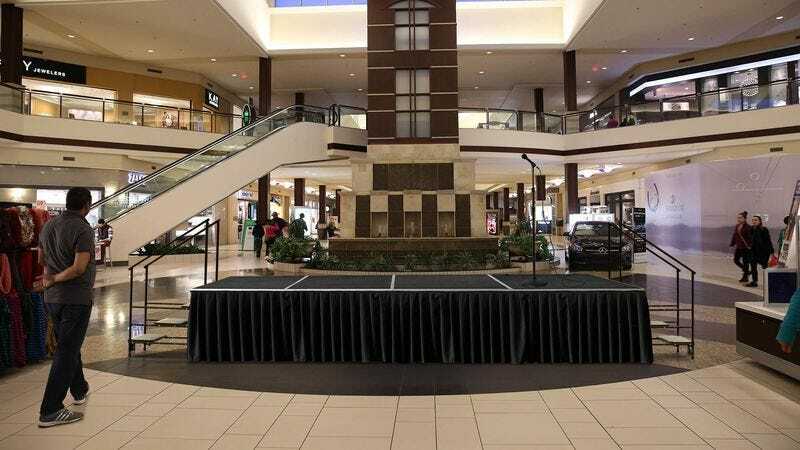 ROCHESTER, NY—Rushing to finish their errands and leave the premises as quickly as possible, every patron at the Eastview Mall reported Thursday that they were quietly dreading whatever has been planned for the empty stage erected near the south entrance of the shopping center. “Oh, Christ, why the hell do they need three microphones?” said shopper Dalia Adams, 38, who nervously added that she had spotted a small child in a sequined top hat lurking near the stage. “I don’t even want to know what they plan to do with that huge PA system. And it looks like there’s a lot of room up there for people—maybe a bunch of people—to dance around. If it’s some kind of swing dancing thing, we gotta get out of here right now.” At press time, nearly 2,000 shoppers simultaneously cursed under their breath and headed for the nearest available exit just as a sound check began.